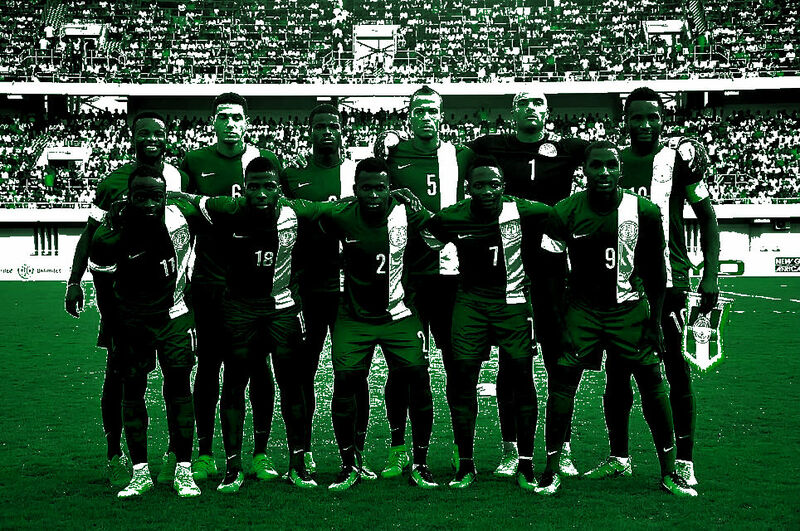 The Nigerian National Senior team fondly referred to as the Super Eagles will be heading to the World Cup with one of the youngest squads in the competition. As at when the draws for qualification were made; many observers; from the regular guy on the street, to Journalists and market women believed the Super Eagles stood no chance of qualifying from such a tough group that had current African Champions Cameroon, Africa’s number 1 ranked side; Algeria and the youthful but enterprising Chipolopolo of Zambia. Now this apprehension was justifiable by virtue of the team’s failure to qualify for back to back African Cup of Nations despite been champions as recently as 2013. Nigeria got off to a great start with a 2-0 victory away to Zambia as the qualification series began with Gernot Rohr at the helm after the NFF had made a mess of getting Paul Le Guen on board; talk about a great way to announce yourself to Nigerians, who were unconvinced of Rohr’s coaching credentials. Many felt his credentials weren’t solid enough for someone looking to guide one of Africa’s football super powers; especially considering his less than impressive stints in Niger, Gabon and Burkina Faso. With Rohr, Nigeria have a coach who has shown maturity and responsibility in his handling of the Super Eagles; this has shown in the way the team has played and conducted themselves all through the successful World Cup qualification series which saw the Super Eagles get comfortable victories against Algeria and Cameroon in Uyo; Akwa-Ibom against all odds to confirm qualification with a game to spear. Over the last five years or so; the Super Eagles have flirted with the 4-3-3 formation and the 4-2-3-1 to varying success; chief of which was the AFCON success of 2013 under Stephen Keshi. I have stoutly been against this approach for I do not think it plays to the strength and weaknesses in the team. As we speak; Nigeria lacks a proper midfield playmaker; a player that can seize the initiative to drive the team forward; instead over the years the production of a number of very quick and athletic wingers has taken centre stage; which has led to the wide areas being Nigeria’s main creative outlet; on the strength of this I would prefer a return to the more balanced 4-4-2 formation. The defence continues to be the biggest headache for Rohr and his coaching crew; especially from the Goalkeeping position. A number of people have called for the return of former captain; Vincent Enyeama who departed the National team under a storm. At the moment; the responsibility of manning the sticks lie with a 19 year old, two home based players and a PSL based goalie. Nigerians are worried that this position might be their Achilles heel. From the 30 man list released for the Pre World Cup Camp; the Central defensive partnership of Turkish based Troost Ekong and German based Leon Balogun fondly called the Oyinbo wall; seem most likely to continue their growing relationship with reservations and trepidations on those to play in the full back positions; as Shehu Abdullahi, Tyrone Eguehi, Bryan Idowu and Ola Aina are in the fore front but there’s also the experienced and sometimes lax Elderson Echiejile. In the friendly victory against Argentina in November, 2017; Rohr tried playing three at the back to much applause; but I do not see him returning to this approach as he isn’t a coach that changes tactics more often which is synonymous with most National Team coaches anyway. I do not think there’s any team in the World that has so many like for like players in one position like the Super Eagles have in midfield. The so called engine room of the team consist mainly of defensive, industrious and work man like players with little or no creativity in the position. Nigeria largely relies on John Obi Mikel for its creativity from the middle of the park; however this creativity continues to lack as Mikel seems more like a deep lying midfielder; more comfortable with pinging passes from deep positions as against taking the game by the scruff of the neck, driving the team forward with finesse, guile and electric dribbles. Other member s of the department are Leicester’s Wilfred Ndidi; one of the best tacklers of the ball in the Premier League and Europe as a whole; the slow but experienced Onazi, the lively and energetic trio of Etebo, Joel Obi and John Ogu complete the possible midfield contingent to the World Cup. During the qualification series the Super Eagles played with one out and out striker with Odion Ighalo seeming the preferred and most effective choice; the only time Rohr tried to shake things up was in the loss against South Africa in the AFCON qualifiers; where Kelechi Ihenancho led the line in an abysmal performance on home soil. Ighalo seems to be the only reliable Striker in the Super Eagles ranks with the rest only available to take supporting roles. The case of Ihenancho continues to be a worry as many have argued what is best position is; most believe his best position is behind the striker and not as the man leading the line; now this poses a problem with how the Super Eagles have lined up in the past. 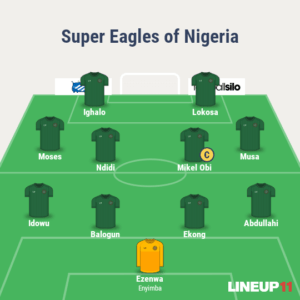 This department is where the Eagles are supposedly strongest with pace to burn all over the front line as the likes of Ahmed Musa, Victor Moses (plays as a forward for the Super Eagles), Alex Iwobi and Moses Simon look to slug it out for the wide positions. The emergence of home based, Junior Lokosa of Kano Pillars and Crotone’s Simy Nwankwo may have added to Rohr’s attacking selection headache; both strikers are in good form with Lokosa currently leading the NPFL goal scoring chat with 18 goals in 21 games ; a potential gate crasher. Nigeria find themselves in a very tough group with perennial opponents Argentina, Croatia and Iceland. The Super Eagles have always done well against European opposition at the World Cup; so facing two European teams should inspire some confidence; Argentina as the final game, could be a dead rubber. A lack of invention in midfield may be Nigeria’s undoing; the alternative option would be to rely on the wingers to provide the creativity but over the years their delivery, decision making and final balls leave little to be desired. I believe Nigeria has a better chance if a switch to 4-4-2 is made with a partner for Odion Ighalo in either Ihenancho or Lokosa; only then will the Super Eagles stand a chance to progress from Group D.
Adeyemi is a Sports Events & Business Consultant; a radio and TV Pundit in Lagos Nigeria. My Twitter handle is @yemiTM442.